An update release to RMC 7.5 was announced today. Find out about the details here. The RMC team released ifix2 for Rational Method Composer 7.5 today. Use IBM Installation Manager to download and install the update. The most important addition in this release is the inclusion of translations of the IBM Practices to German, French, Italian, Spanish, Portuguese, Japanese, and Korean. Contact tech support or your local tech rep to find out how to get these new translations. In addition to the translations the update fixes a number of minor bugs around variability, spell-check, inconsistencies when publishing, and WBM export. See the readme in the installation directory after the update for the complete list. Plus, it ships with the RAM client for version 7.1.1, which allows you to connect to the latest RAM server version. Click here to start the video. It requires that you have the Adobe Flash Player installed for your browser. We released the first bug fix release for IBM Rational Method Composer 7.5 last night. Go and get it by running IBM Installation Manager and clicking the Update button. After the install you can find a list with all the issues addressed in the Readme file inside the installation directory. This ifix does not only fix the tool, but also a few issues in the Practices method library and published configurations. Therefore, the download is a bit larger than normal. Note, that we also made fixes and improvements for both skins. So if you have your own skins defined make sure you merge in all our changes into your skin files using a compare-merge tool. IBM’s DeveloperWorks now features a landing page that introduces IBM’s Development Practices at http://www.ibm.com/developerworks/rational/practices/. This page provides an overview to practices and links to one page summaries for 14 practices with links to resources and references. Needless to say that all of these practices are available as fully modeled, documented, and reusable practices in IBM Rational Method Composer 7.5, which currently ships with altogether 21 practices. You can use Method Composer to assemble and publish the right set of practices that you would like to implement as well as use the tool to customize and extend each practice to represent your exact way of working. If you are an experienced RMC user and want to see a quick overview to what is new and noteworthy in Rational Method Composer 7.5 then check out this new page. If you are new to RMC make sure to also review some of the overview material listed on the Resources page. Check back here for more upcoming collateral for RMC 7.5 and Practices. The new version 7.5 of Rational Method Composer is available today. Despite its version number this is a major new release of this modeling environment and framework. The most important addition is all new content referred to as IBM Practices, as well as tool features around practices that allow you to create and manage your own agile mashups. Find in there core agile practices that you know from literature and allow you to assemble processes that combine the best of approaches such as Scrum, XP, OpenUP. 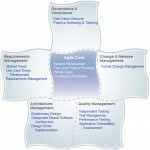 In addition, we provide practices that allow you to scale up your agile development projects based on IBM’s own experience in doing agile development work in very large globally distributed development projects. Every practice also provides guidance for implementing it into your organization as well as and metrics to use to self-assess how successfully you adopt each practice. 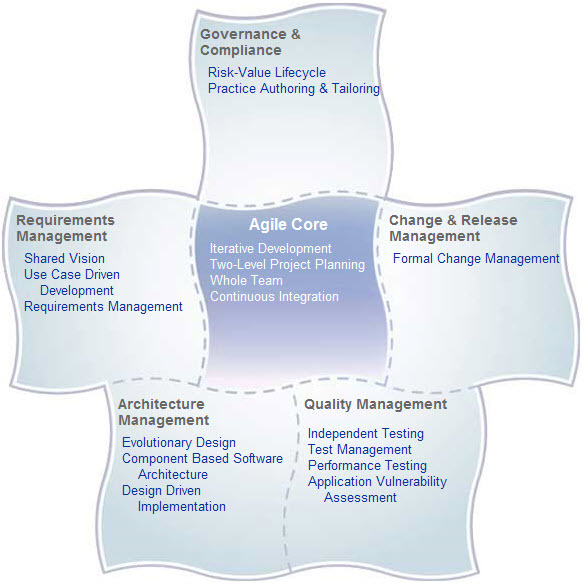 See the image below for lists of the most important practices available for scaling agile development. Use the new RMC process builder perspective to intuitively browse and select these practices using a simple shopping cart paradigm to assemble and publish a Web site to get you started. Then evolve these practices using RMC to make them your practices that reflect your way of working or add your own. In addition to the support for practices we provide many new other capabilities and enhancements addressing many customer requests such as command line publishing, spell checking, a graphical image map editor, tagging, query-based categories, an integration with Rational Asset Manager, and many more. Check out the official annonucement document for more details on the new features. Also watch this space for additional collateral that we are providing on DeveloperWorks and ibm.com around IBM Practices and RMC in the coming days and weeks.